You see, in the non-commercial/non-truck world, the federal government distinguishes between “passenger cars” and “other 2-axle 4-tire vehicles.” In 2008, there were 137 million passenger cars, which works out to about 446 cars per thousand people. However, there were also 101 million “other 2-axle 4-tire vehicles,” primarily in the fast-growing category of SUVs and pickup trucks. Add that up and you get 238 million of the things that we’d ordinarily call cars, which comes to about 775 vehicles per thousand people. In Germany, apparently, they don’t make this distinction. In the non-commercial/non-truck world they put everything into one bucket and just count 44 million “cars.” That comes to about 544 vehicles per thousand people. 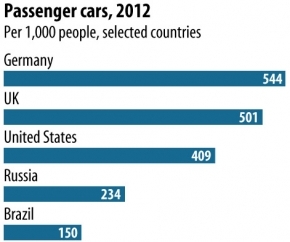 Unsurprisingly, then, it turns out that we have more cars per capita than Germany. You just have to be careful about comparing national statistics across borders.